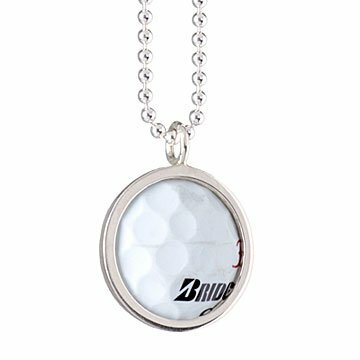 Hit it on the green with this necklace made from PGA-licensed balls plucked from the water at TPC Sawgrass. Give the lady of the green a trinket that's right on par. Made from PGA TOUR-licensed golf balls, each one was plucked from the famed 17th Island Green water at TPC Sawgrass in Ponte Vedra, Florida. Officially licensed by the PGA TOUR. Handmade in the Mexico. Each necklace can be verified here and comes in a black gift box for stylish appeal. Visit our blog to see how sunken golf balls are recovered to create these necklaces. Check out our TPC Golfball Cufflinks for him. Chain: 18"; Pendant: Dia. 0.88"
I purchased this as a donation for a Breast Cancer Golf Tournament. They decided to use it in the raffle and we had so many women that were hoping to win this great necklace. The only problem was that there was only one!!!!! Brought the biggest smile I've seen! Outstanding and meaningful gift for female golfers, especially those who've lost a ball in the drink!